BRIGHT LIGHT - DLC Verified! The 22 watt is rated at 1650 Lumens. 1,650 Lumens can replace a 50-150W HPS/HID/HALIDE light. 5000K light color ensures a bright clear light. BETTER DESIGN -New LG LED modules Improve Efficiency - Save even more by using a lower watt unit. Compare the lumens against others. 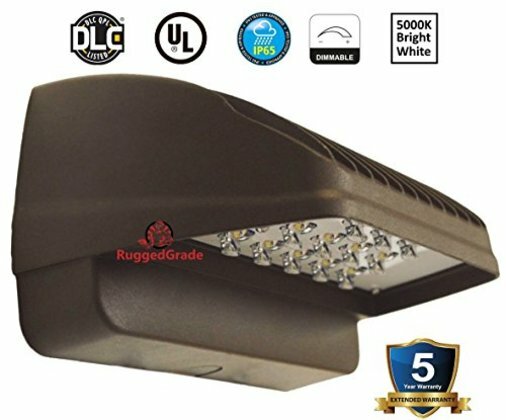 Premium grade components make this an industrial grade LED High Bay Light. CERTIFIED & BUILT TO LAST - UL Listed and DLC verified for safety and rebate eligibility. UL Certified products ensure better quality, safety and reliability. DLC is the Design Lights Consortium for independent verification of performance. Aluminum Housing with high tech Heat Sink. Better Heat dissipation ensures longer LED life and safety. IP65 Waterproof for all weather conditions. All backed by a 5 year warranty. EASY INSTALLATON & OPTIONAL PHOTOCELL. Unit has multiple conduit entrance locations and a standard circle cutoff in the rear for easy installation. Whether you are retrofitting an old unit or doing new construction, these are easy to use. Wiring is Brown to Black, Blue to White and Green to Green Stripped. Dusk to Dawn sensors (Photocells) can be added but are not required.